Anritsu Corp. announces that Qualcomm Technologies Inc., a subsidiary of Qualcomm Inc., has accepted Anritsu’s Radio Communication Test Station MT8000A and CATR Anechoic Chamber MA8172A as a validated test method to conduct 5G measurements. Mulder Appointed President and CFO of Anritsu Co.
Donn Mulder was named the president and CFO of Anritsu Co., the U.S. subsidiary of Anritsu Corp, by Anritsu's board of directors. He assumes the new role immediately. Anritsu Corp. is pleased to announce that Korean operator LG U+ has decided to use Anritsu’s Network Master™ Pro MT1000A supporting speeds up to 100 Gbps for 5G service. Anritsu Corp. is pleased to announce that the Global Certification Forum (GCF) has approved the world’s first 5G NR Protocol Conformance tests on the 5G NR Mobile Device Test Platform ME7834NR at their January 2019 CAG57 meeting. Anritsu Corp. announces the successful completion of 5G Standalone (SA) connection testing between Anritsu’s Radio Communication Test Station MT8000A and a mobile smartphone form-factor test device from Qualcomm Technologies Inc., including the company’s 5G modem and antenna modules with integrated RF transceiver, RF front-end and antenna elements. Anritsu Co. introduces metrology-grade W1 coaxial components designed and manufactured for precision performance and repeatability to 110 GHz. MediaTek Inc. and Anritsu Corp. have agreed to forge a partnership for 5G development and physical layer verification. Anritsu Company enhances its Network Master™ Pro MT1000A to support 100 Gbps with Ethernet Common Public Radio Interface (eCPRI) and IEEE 1914.3 Radio over Ethernet (RoE), as well as high-accuracy delay measurement functions. Anritsu Company introduces two Gigabit LTE software options for its Signalling Tester MD8430A to support the increased communications speeds associated with LTE-Advanced Pro (LTE-A Pro). Anritsu Corporation announces its new 5G test platform to help support test development for Qualcomm Technologies Inc., a subsidiary of Qualcomm Incorporated, on 5G chipsets. Anritsu Corporation announced that the company’s partnership with Trescal has been expanded to cover The Netherlands. Anritsu Corporation has signed a distribution agreement for the UK with Comtec Cable Accessories Ltd.
Thomas Elliott and Russel Lindsay, Anritsu Corporation, Morgan Hill, Calif.
Anritsu Company announces that it is the first test company to earn GCF approval for more than 80 percent of Cat-M1 RF conformance test cases for frequencies used in Japan, North America and Europe. Anritsu Company and ETS-Lindgren announce groundbreaking support of IEEE 802.11 ac/n/a/g/b Over-the-Air (OTA) testing with an enhanced solution that integrates the Anritsu Wireless Connectivity Test Set MT8862A with the CTIA-compliant ETS-Lindgren EMQuest™ EMQ-100 Antenna Measurement Software. Anritsu Company announces that its LTE-Advanced RF Conformance Test System ME7873LA has earned the first GCF certification for the LTE Category M1 (Cat M1) RF Conformance Test, as part of IoT communications technology. Anritsu and EMITE are proud to announce that the new Anritsu Wireless Connectivity Test Set MT8862A, an integrated one‐box test set specifically for testing IEEE802.11 WLAN devices, has been successfully used in combination to the EMITE E500 Reverberation Chamber to test OTA figures of merit for IEEE802.11ac/n/a/g/b devices. Anritsu Company announces a Network Mode for its Wireless Connectivity Test Set MT8862A, which is an instrument capable of supporting various WLAN protocol standards such as IEEE802.11ac/n/a/g/b. This makes the MT8862A the industry’s first solution capable of measuring the performance of an 802.11ac-capable WLAN device under test (DUT) in the actual operating state. Anritsu Co. released a new version of its award-winning SkyBridge Tools™ Test Manager that supports OTDR measurements to establish the industry’s first comprehensive field test automation tool that supports both RF and optical testing. By reducing test time by as much as 90% and increasing accuracy more than 10 times, SkyBridge Tools dramatically simplifies network installation verification, allowing contractors to close out projects more efficiently, receive prompt payment, and start new projects faster. Anritsu Co. will host a connected car seminar for automotive professionals that will discuss technology innovations, their benefits and test requirements necessary to ensure their successful implementation in the new generation of automobiles. The Understanding the Technology Driving Connected and Autonomous Vehicles will be held at the CETECOM™ laboratories in Milpitas, Calif., December 8 and provide roadmaps on LTE-Advanced, 5G and vehicle to everything (V2X) technologies. Anritsu Co. expands its field test portfolio with the introduction of PIM Hunter,™ a passive intermodulation test probe that helps field technicians more quickly discover the precise location of external PIM sources at cell sites. Designed for use with Anritsu’s PIM Master,™ Spectrum Master™ and BTS Master™ handheld analyzers, the PIM Hunter test probe enables field professionals to use traditional interference hunting techniques to accurately locate external PIM sources for optimum wireless network performance. Anritsu Co., as part of its commitment to developing 5G technology, announces its participation in the National Science Foundation (NSF)-led Advanced Wireless Research Initiative, which includes a program to enable the design, development, deployment and operations of four city-scale testing Platforms for Advanced Wireless Research (PAWR) over the next decade. The Advanced Wireless Research Initiative is further aligned with the White House Smart Cities Initiative, which aims to make it easier for cities, federal agencies, universities, and the private sector to work together to research and test, sometimes at scale, new technologies that can help make United States cities and communities more inhabitable, cleaner and more equitable. Anritsu Co., Morgan Hill, Calif.
Anritsu Co. introduced new software for its Radio Communications Analyzer MT8821C that creates the industry’s first test solution that supports evaluation of 4x4 MIMO 256 QAM RF Rx performance for all DL 3CC CA band combinations with no restrictions on frequency and signal bandwidth combinations. The new software provides wireless chipset and UE manufacturers, as well as mobile operators with a solution to conduct efficient, highly accurate carrier acceptance tests to ensure performance. Anritsu Co. announces that is has earned the 2016 Global Product Line Strategy Award—Manufacturing Test Software for IoT from Frost & Sullivan. In making the announcement, Frost & Sullivan stated that newly released software packages from Anritsu uniquely position the company’s Universal Wireless Test Set MT8870A as an all-in-one instrument with unmatched solutions that support a wide range of wireless technologies to conduct high-volume production tests on IoT devices. Autotech Council Member Anritsu Co. (booth #9046) will showcase its industry-leading test solutions that efficiently and accurately verify connected car designs at the Automotive Test Expo, to be held October 25-27, Novi, Michigan. In addition to product demonstrations, Anritsu is also an Open Technology Forum participant and will present a roadmap on LTE and how to test connected car systems using wireless technology, highlighting the global test company’s leadership position in the new generation of automotive designs. Anritsu Co. expands its industry leading CPRI test portfolio with the introduction of a BBU Emulation capability for its BTS Master™ MT8220T that saves significant time and cost when verifying LTE cell site operation. Anritsu Co. introduces the ultraportable Site Master™ S331P, the lightest, smallest, fastest and most cost-efficient Site Master field cable and antenna analyzer ever developed. The S331P provides wireless operators and contractors, DAS installers,and public safety network installers and maintenance professionals with the first pocket-sized headless cable and antenna analyzer that can measure the new LTE-U frequencies. Anritsu Co. introduces Cellular Module Test Application (CMTA) software for its Signaling Testers MD8475A/B which provides test cases to dramatically simplify testing chipsets and automotive-related telematics modules used in connected car designs and implementation. Anritsu Co. introduces CPRI RF measurement capability in its market-leading E series of Site Master™, Spectrum Master™ and Cell Master™ handheld field analyzers that dramatically simplifies and lowers the cost of testing Remote Radio Heads (RRHs) installed atop 4G towers. Anritsu Co. introduces the Signaling Tester MD8475B, the world’s first all-in-one test solution supporting up to four component carrier aggregation (4CC CA) and 2x2 MIMO in a single test box. Integrated with the SmartStudio GUI, the MD8475B lowers cost-of-test and reduces space requirements compared to conventional solutions that require several test instruments, providing engineers with a highly efficient tool to conduct tests on chipsets, modules, and mobile platforms integrating the most recent LTE-Advanced specifications. Anritsu Co. expands its Signal Analyzer MS2840A family with the introduction of three models that support the 9 kHz to 3.6 GHz, 6 GHz, and 26.5 GHz frequencies. With the new instruments, Anritsu fills a market void for cost-efficient, high-performance signal analyzers that address the middle frequency ranges, providing an economical solution to accurately measure wireless equipment, oscillators and other components for narrowband applications, land mobile radio, wireless backhaul, radar and automobile electronics. Anritsu Co. announces its Signaling Tester MD8475A now supports 98 percent of conformance test cases (defined as EN16454) for emergency call (eCall) communications modules, expanding the company’s test solution portfolio for connected car designs. Anritsu Co. (Booth #949) will showcase its high-frequency test solutions that address the complex challenges associated with emerging microwave and millimeter wave (mmWave) designs, such as automotive radar and 5G, at IMS2016. Anritsu Co., the industry leader in field spectrum analysis tools, introduced the MS27100A Spectrum Monitoring Module that brings Anritsu’s field-proven, industry leading RF spectrum analysis technology to OEM applications. Anritsu Co. continues to address the test needs of signal integrity (SI) engineers with the introduction of options for its VectorStar® and ShockLine™ vector network analyzers (VNAs). The VectorStar Eye Diagram and ShockLine Advanced Time Domain (ATD) options are part of the expanding SI capabilities offered by Anritsu and provide SI engineers with improved tools to conduct channel diagnostics and model validation of high-speed digital circuit designs. Anritsu Co. and TRX Systems announce they have entered into a partnership whereby Anritsu’s industry leading handheld analyzers are integrated with a 3D Indoor Location and Mapping solution from TRX Systems to create the industry’s first automatically geo-referenced RF signal mapping solutions. Anritsu Co. announces that its ME7873LA RF/RRM Conformance Test System (CTS) leads the industry in total number of validated PTCRB 3CA LTE test cases supported by any platform. Anritsu Co. introduces software packages for its all-in-one Radio Communication Analyzer MT8821C that support LTE-Advanced UE Downlink (DL) 4x4 MIMO and Downlink Carrier Aggregation (DL CA) 5CCs. The new software packages further strengthen the test functionality of the MT8821C and help create a single-instrument solution that can speed time to market and lower test costs of LTE-Advanced chipsets, smartphones, tablets and M2M modules used in IoT applications. Teledyne LeCroy, Coherent Solutions Ltd., Anritsu Co., and Oclaro Inc.
Teledyne LeCroy, Coherent Solutions Ltd., Anritsu Co. and Oclaro Inc. announced a new joint effort to demonstrate the highest performance single-carrier 16 QAM signal generation and analysis capabilities available at 56 Gbaud. The demonstration of the partners’ latest optical communications test equipment platform takes place at OFC 2016 in Anaheim, Calif. in the Teledyne LeCroy Booth #1115. Anritsu Co. announces exclusive support for LTE 4x4 Multiple-In-Multiple-Out (MIMO) Carrier Acceptance Test (CAT) requirements for a major U.S. carrier. This new coverage, based on the ME7834LA Mobile Device Test Platform, builds on the leading 3G and LTE CAT test offering for this carrier. With this announcement, Anritsu is the first test solution provider in the world to offer a device acceptance solution for 4x4 MIMO. Anritsu Co. announces it is a founding member of the Open Lab Alliance (OLA), a collaboration of industry leaders with the common goal of advancing connected vehicle and autonomous vehicle technologies. The OLA was officially launched during a grand opening ceremony at the CETECOM laboratory in Milpitas, Calif.on February 12, 2016. Anritsu Corp.’s MT8820C Radio Communication Analyzer now integrates with both DASY6 and cSAR3D from Schmid & Partner Engineering AG to provide seamless Specific Absorption Rate compliance testing. Anritsu Co. introduces the MA2806A high performance waveguide mixer that can be integrated with its MS2830A Spectrum/Signal Analyzer to create a millimeter-wave (mmWave) measurement solution that eliminates the complexity and uncertainty associated with conventional mmWave signal analysis tools. Anritsu Co. and DVT Solutions will demonstrate an integrated test solution that can conduct high-quality S-parameter measurements as well as time domain analysis on high-speed printed circuit boards (PCBs), packages and backplanes in the Anritsu DesignCon 2016 booth (#717). Anritsu Corp. released its new high performance waveguide mixer MA2806A to expand millimeter wave measurement solutions. Connecting the new MA2806A to Anritsu’s signal analyzer MS2830A supports spectrum measurements in the 50 to 75 GHz Band (V-Band) currently used by various millimeter wave sensors, WiGig Gigabit Wireless LAN (802.11ad), and broadcast video camera streaming equipment. Anritsu Co. continues to expand its industry-leading field test portfolio with the introduction of the MS27101A Remote Spectrum Monitor. The most recent edition to Anritsu’s interference detecting tools, the MS27101A can be used with Anritsu’s Vision™ software to create a highly accurate remote solution for government regulators and university lab researchers to identify interference patterns, record spectrum history and geo-locate the sources of problem signals to mitigate interference issues and identify illegal or unlicensed signal activity. Anritsu Co. continues to provide the most comprehensive test solutions for the installation and maintenance of legacy and emerging wireless networks with the introduction of a Video Inspection Probe (VIP) measurement mode for its Microwave Site Master™ S820E and Site Master™ S331L cable and antenna analyzers. Anritsu Co. introduces an E-band option for its ShockLine™ MS46500B series of 2- and 4-port performance Vector Network Analyzers (VNAs) that addresses the market need to lower cost-of-test for E-band components. With the option installed, the MS46500B series can reduce production costs and more efficiently verify the performance of high-frequency passive components, such as antennas, filters, and duplexers during manufacturing. Anritsu Co. announces the appointment of Paul Innis as vice president and general manager of the Americas Sales Region, incorporating the United States, Canada, Central and South Americas, as well as the Caribbean. Innis will use his extensive experience to successfully position Anritsu Co.’s wide portfolio of product and services into the telecommunications, general industry and government markets, as well as into emerging industries, such as connected cars and the rapidly growing Internet of Things (IoT). Anritsu Co. introduces two options for its MN4765B series of O/E calibration modules that help to create a highly accurate, flexible and cost-effective solution for the characterization of optoelectronic devices such as modulators, photoreceivers and integrated optical transceiver modules. With these new options, the MN4765B can be used with the MS4640B VectorStar® Vector Network Analyzer (VNA) family to perform optoelectronic measurements up to 70 GHz at both 1310 nm and 1550 nm wavelengths. Anritsu Co. announces support for LTE-A 3 Carrier Aggregation (3CA) Carrier Acceptance Test (CAT) requirements at two additional major North American carriers, building on the first announcement of 3CA support for a third carrier in September. Anritsu Co. enhances its MN4765B series of O/E modules for the MS4640B VectorStar® Vector Network Analyzer (VNA) family that creates a cost-effective and flexible solution for measuring 56 Gb/s components and transceivers used in telecommunications and data communications applications. The MN4765B module, combined with the MS4640B VNA, provides a simplified approach for optoelectronic measurements and is an economical alternative to conventional total-system approaches currently used in R&D and manufacturing environments. Anritsu and COMPRION have developed a solution to fully automate the execution of all 3GPP TS 36.523 LTE conformance tests required for certification and pre-certification of mobile devices. Anritsu Corp.has released its new LTE-Advanced Carrier Aggregation (CA) 4CC measurement software for the MT8821C Radio Communication Analyzer, together with multiple new LTE-Advanced capabilities. Anritsu Co. introduces a CPRI RF Measurement option for its BTS Master™ handheld base station analyzer family that can significantly reduce the operational expense (OpEx) associated with troubleshooting interference at base stations. Featuring best-in-class sweep speed and unique test capabilities, the BTS Master-based CPRI RF measurement test set allows field engineers and technicians to conduct accurate RF measurements on Remote Radio Heads (RRHs) while remaining at ground level, eliminating the considerable expense and time associated with calling a tower crew to conduct interference measurements. Anritsu Co. announces that its ME7873LA LTE-Advanced RF Conformance Test System has obtained the world's first LTE 3CA PTCRB certification. By obtaining PTCRB certification for 3CA, the ME7873LA supports deployment of LTE 3CA downlink, expected to be available in North America by the end of the year. Anritsu Co., the global leader who introduced the first handheld wireless network analyzer 20 years ago, ushers in a new era of field wireless testing with the introduction of Remote Spectrum Monitor, a platform of modular and scalable products that helps operators generate a greater return on their multi-billion dollar spectrum investments and maximizes network capacity to meet consumer demand. Jon Martens and Steve Reyes, Anritsu, Morgan Hill, Calif.
PCTEST Engineering Laboratory Inc. and Anritsu Co.
Anritsu Co. announces PCTEST Engineering Laboratory Inc. has acquired all elements of Anritsu’s leading LTE Enhanced Multimedia Broadcast Multicast Services (eMBMS) test portfolio, including eMBMS RF Performance test cases on Anritsu’s ME7873L RF/RRM Conformance Test System (CTS) as well as Carrier Acceptance Test (CAT) and Protocol Conformance Test (PCT) test cases on the ME7834L Mobile Device Test Platform (MDTP). Anritsu Co. introduces SkyBridge Tools, a cloud-based trace judgment solution for tower and in-building Distributed Antenna System (DAS) installations that reduces costs and improves ROI. Serving as a data warehouse for contractors who are installing or modifying equipment for network operators, SkyBridge Tools saves time, reduces rework, and makes timely payment more likely by automating the trace judgment process. Anritsu Co. and Electro Rent announce that the two companies have signed a formal agreement whereby Electro Rent is a preferred reseller for Anritsu test solutions throughout the United States and Canada. Under terms of the agreement, industry-leading Anritsu benchtop and field instruments will be available through Electro Rent. Anritsu Corp. has launched the new MP1861A MUX and MP1862A DEMUX modules for the MP1800A signal quality analyzer. Anritsu Co. has launched the MT8821C Radio Communication Analyzer for research and development testing of mobile devices. Anritsu Co. expands its ShockLine™ family of affordable vector network analyzers (VNAs) with the introduction of the Performance ShockLine MS46500B series. Anritsu Co. introduces a Vector Voltmeter Mode (VVM) for its Microwave Site Master™ S820E - the world's only handheld cable and antenna analyzer offering coverage up to 40 GHz – that allows the S820E to be used as a drop-in replacement for legacy Vector Voltmeter instruments. With the ability to provide full A/B and B/A ratio capability without additional and expensive VNA options, the S820E with the VVM provides field engineers and technicians with a compact, durable, cost-efficient single-instrument solution to make key field measurements to ensure the proper deployment, installation, and maintenance of wireless networks. Anritsu Co. introduces a Vector Voltmeter Mode (VVM) for its Microwave Site Master™ S820E – the world’s only handheld cable and antenna analyzer offering coverage up to 40 GHz – that allows the S820E to be used as a drop-in replacement for legacy Vector Voltmeter instruments. Anritsu Co. introduces Web Remote Tools for its Spectrum Master™ MS2720T handheld spectrum analyzer that allows the instruments to be controlled from any web-enabled device, including laptops, tablets, and smart phones, over an Ethernet link. Web Remote Tools gives field technicians greater flexibility when conducting measurements and makes it more time- and cost-efficient to conduct RF spectrum monitoring, as well as test Remote Radio Heads (RRUs) and other inaccessible radio units at 3G and 4G base stations. Anritsu Co. and EMITE announce that the Anritsu MT8820C radio communication tester has been successfully used in combination with the EMITE E500 reverberation chamber and Anite Propsim FS8 channel emulator to test LTE Carrier Aggregation, using 2x2 MIMO and more realistic isotropic Urban-Macro (UMA) fading profiles. Anritsu Co. announces it successfully completed testing of GCT Semiconductor’s 4G LTE-Advanced chip, GDM7243Q, using Anritsu’s MD8430A signaling tester with Rapid Test Designer (RTD). GCT Semiconductor, a leading designer and supplier of advanced 4G mobile semiconductor solutions, offers an advanced FDD-TDD LTE Category 5/6/7 single chip, with the world’s first 4X4 MIMO carrier aggregation for LTE. Anritsu Co. introduces the MN25208A SmartCal two-port 8.5 GHz auto calibration unit for its ShockLine family of vector network analyzers (VNAs). A plug-and-play calibration unit, SmartCal automatically powers on via a USB connection and loads calibration coefficients from on-board memory, for faster setup and error-free calibrations. Anritsu Co. introduces the MN4765B O/E Calibration Module for its MS4640B Series VectorStar® vector network analyzers (VNAs) that creates a cost-effective and flexible solution for measuring 40 Gb/s components and transceivers. Anritsu Co. introduces the ShockLine™ MS46121A series of 1-port USB Vector Network Analyzers (VNAs) that bring the price, performance, and ease-of-use advantages of Anritsu’s patented ShockLine VNA technology to an extremely compact package. Anritsu Co. announced it has developed a turnkey small cell manufacturing test solution with Cavium Inc. that also supports technologies such as cellular, WLAN 802.11ac, Bluetooth®, ZigBee (802.15.4), and location-based services (LBS). Leveraging the flexible MT8870A Universal Test Set platform, Anritsu is addressing the growing need for small cell test solutions that can lower the cost of test and speed time to market of next-generation wireless chipsets and devices. Anritsu Co. will showcase its field test solution portfolio that addresses the critical needs of field engineers and technicians responsible for erecting, servicing, and maintaining broadcast and telecommunications towers at NATE 2015. Anritsu Co. announced it will feature a sophisticated, cloud-based connected car system for fleet tracking developed by the University of Hertfordshire in the UK using Anritsu network simulation technology in its stand (Hall 6/6F40) at Mobile World Congress 2015 (MWC), to be held March 2-5 in Barcelona. Anritsu Co. introduces a unique capture and playback function for its MS2830A and MS269xA Spectrum/Signal Analyzer families that brings the most challenging RF environments from the field into the laboratory or production line. Anritsu Co. announces its ME7873L RF/RRM Conformance Test System has achieved more than 80 percent of RF/RRM conformance test cases approval by the Global Certification Forum (GCF) related to LTE-Advanced TD-LTE Carrier Aggregation. Samsung Electronics Co. Ltd, a global leader in digital media and digital convergence technologies, has selected the Anritsu MD8475A Signaling Tester with SmartStudio Manager software for automated smartphone testing. Anritsu Co. announces that its MD8475A signaling tester with SmartStudio Manager Windows-based control software now provides multi-operator support for Commercial Mobile Alert System (CMAS) Carrier Acceptance Test (CAT) packages. Anritsu Co. introduces an option for its MT8852B Bluetooth test set that supports the Data Length Extension associated with Bluetooth Low Energy (BLE) as part of the latest Bluetooth Core Specification version 4.2. Anritsu Co. introduces functionality for its BTS Master™ MT8220T base station analyzer that allows field engineers and technicians to conduct highly accurate and efficient LTE-Advanced Carrier Aggregation (CA) measurements during network deployment and maintenance. Anritsu Co. has introduced the MW82119B PIM Master™ that combines a 40 W, battery-operated PIM analyzer with a 2 MHz to 3 GHz cable and antenna analyzer, eliminating the need to carry multiple instruments to measure the RF performance of a cell site. The MW82119B PIM is MIL-STD-810G drop test rated and is designed to withstand transportation shock, vibration and harsh outdoor test conditions. Anritsu Company expands its industry leading training courses with the introduction of Interference Analysis (IA) Certification, a comprehensive, instructor-led training class to help wireless professionals locate interference sources. The three-day course has been developed by Anritsu to help cellular technicians, wireless carrier performance engineers, field engineers, and personnel from government, military and security agencies ensure optimum wireless network performance in an ever-crowding RF spectrum. Anritsu will demonstrate two contrasting series of vector network analysers (VNAs) at its stand 107 at European Microwave Week 2014, October 7-9 in Rome, Italy. Anritsu, a global leader in wireless telecommunications test equipment, announces that it is the market’s leading supplier of the first industry approved protocol conformance test cases for mobile devices capable of receiving evolved Multimedia Broadcast Multicast Services (eMBMS) broadcasts. Anritsu announces the appointment of Pete Alexander, PhD as Vice President and General Manager of Anritsu Company, the United States subsidiary of Anritsu Corporation. Alexander, who has 25 years of experience in the test and measurement industry, will be responsible for all sales, marketing and field support operations for Anritsu's wireless, optical, microwave/RF, and digital test solutions in North America and Latin America. Anritsu Corporation Microwave Measurement Division (MMD) announces that the China National Institute of Metrology (NIM) Microwave Parameters Lab has selected the Anritsu VectorStar™ ME7838A 110 GHz broadband Vector Network Analyzer (VNA) system. The lab will use the advanced test solution to develop standards for on-wafer S-parameter calibration procedures. Anritsu spectrum analyzer/signal analyzer now compatible with satellite carrier monitoring system from SAT Corp.
Anritsu Co. announces its MS2830A Spectrum Analyzer/Signal Analyzer is now compatible with the Monics satellite carrier monitoring system from SAT Corp. (SAT), a subsidiary of Kratos Defense & Security Solutions, Inc. A new driver enables the MS2830A, which combines high speed and performance in a cost- and energy-efficient design, to be integrated into the Monics enterprise networked carrier monitoring system used by government agencies, satellite operators, satellite service providers, and telecommunications companies. 7Layers and Anritsu Co. announce that 7Layers has upgraded its ME7873L RF/RRM conformance test system with Rel. 8, Rel. 9, and Rel. 10 Radio Resource Management (RRM), as well as carrier aggregation (CA) test capabilities. This upgrade significantly expands the 7Layers test portfolio, including RRM capabilities for conformance test (CT), carrier-specific RRM capabilities for carrier acceptance test (CAT), and Anritsu’s market-leading capabilities for LTE Advanced CA. Anritsu Co. (DesignCon booth #501), a world leader in high-speed signal integrity test solutions, will present a series of technical and educational sessions during DesignCon to help engineers solve the measurement challenges associated with designing high-speed semiconductors, and communications systems and devices. Additionally, technical demonstrations will be held in the Anritsu booth throughout DesignCon, which is scheduled for January 28-31 in the Santa Clara Convention Center, Santa Clara, CA. Anritsu Co. announces it has worked with Qualcomm Technologies Inc. a wholly owned subsidiary of Qualcomm Inc., to successfully demonstrate peak throughput for a Category 6 LTE device and network simulator using 20+20 MHz carrier aggregation (CA). The two companies have jointly performed tests with a device based on the new Qualcomm® Gobi™ 9x35 modem, the world’s first LTE Advanced World Mode Category 6 chipset solution. Anritsu Co. announces a working cooperation with Wild River Technology. The two companies are collaborating to provide test solutions that meet the rigorous test requirements associated with high-speed serial data interconnects, SERDES testing, cables, and backplanes used in NGNs. Anritsu Co. announces its market-leading ME7873L RF/RRM Conformance Test System and ME7834L Mobile Device Test Platform have received the most test case validations across a single platform type for LTE-Advanced Carrier Aggregation (CA). This breakthrough further affirms Anritsu’s commitment to provide solutions for certification testing of mobile devices that implement CA, one of the key LTE-Advanced features defined in 3GPP Release 10. Anritsu Co. introduces a 32 Gbit/s extension option for its MP1825B 4Tap Emphasis that features industry leading Tr/Tf speeds and low jitter for up to four taps, allowing it to create emphasis that matches every industry standard. The MP1825B with the new option can be configured with the Anritsu MP1800A BERT signal quality analyzer to accurately measure the performance of high-speed interconnects used in Next Generation Network (NGN) applications in a cost- and time-efficient manner. Anritsu Co. will be showcasing a wide range of industry leading Test & Measurement solutions at the European Microwave Week 2013, to be held in Nuremburg 8th to 10th October. The newly released MS4640B series of VectorStar vector network analyzers (VNAs) will be on display, together with the MS2830A Spectrum and Signal Analyzers, a range of signal generators, and the handheld RF analyzers, all of which demonstrate different areas of technical leadership. Anritsu Co. introduces the MT8220T BTS Master, a multi-function handheld durable tester with all the capabilities network operators, sub-contractors, installers, and regulatory authorities need when measuring base stations. It is the third generation of Anritsu’s field-proven BTS Master family. Anritsu Co. introduces software enhancements to its MD8430A Signaling Tester that make it the first LTE network simulator to support Time Division Duplex LTE (TD-LTE) Carrier Aggregation (CA) test functionality. The MD8430A is the industry’s leading platform for device testing from development to certification and carrier acceptance. Anritsu Co. expands its VectorStar family of Vector Network Analyzers (VNAs) with the introduction of the MS4640B series. Anritsu Corp. announces its first LTE-Advanced (LTE-A) Carrier Aggregation (CA) test case submissions to RAN 5, demonstrating a strength in protocol conformance that extends across current 2G, 3G, and leading-edge LTE technology. This follows its recent world first in validating RF conformance test cases for CA in PTCRB. RAN 5 verification paves the way for protocol test validations and the inclusion of this technology in GCF and PTCRB certification. Anritsu introduces TD-SCDMA signaling test capability for its industry-leading RTD solution. The new software enables chipset and mobile device makers to test their implementation of the 3G mobile communications standard used by China Mobile®. Anritsu Co. (booth #938) will display test solutions to meet the high-frequency testing requirements of engineers in the aerospace and defense, communications, and semiconductor industries at IMS 2013 in Seattle, June 4-6. Featured will be the VectorStar Vector Network Analyzer (VNA) platform, which is an ideal solution for device characterization, as well as solutions for measuring components and subsystems used in radar, high-speed serial, microwave backhaul, wireless network, and other applications. Anritsu Co. announces its MS2720T Spectrum Master™ handheld spectrum analyzer with option 709 has been self-certified to comply with the National Radio Systems Committee requirements for conducting AM and FM measurements. Anritsu Co. announces its MD8475A Signaling Testing, MG3710A Vector Signal Generator, and PIM Master MW82119A have been nominated for the 2013 CTIA Emerging Technology (E-Tech) Awards, which celebrate and promote the most innovative wireless products and services in the consumer, enterprise, application, and network technology segments. Anritsu Co. introduces multi-band receivers for its Link Master drive test tools that offer field engineers, technicians and consultants a complete drive test system for locating interference and ensuring optimum wireless network operation. Anritsu Co. introduces the MA2700A InterferenceHunter handheld direction finding system that enhances interference mapping and simplifies locating interference sources in wireless networks. Designed for use with Anritsu’s BTS Master™, Cell Master™, Site Master™ and Spectrum Master™ handheld analyzers, the MA2700A InterferenceHunter can be used by field engineers and technicians during deployment, installation, and maintenance of wireless networks. It is ideally suited for use in spectrum clearing and interference mitigation. Anritsu Co. announces the Toughest Site Competition 2013 that recognizes the challenges faced every day by field engineers and technicians responsible for deploying, installing, and maintaining wireless networks. The contest, which runs until June 30, 2013, highlights how field professionals overcome harsh weather conditions, extreme environments, and technical challenges to ensure the operation of private and commercial wireless networks. Anritsu Co. will be exhibiting the new P25 Phase 2 TDMA analysis capability of its S412E LMR Master, as part of its portfolio of test solutions to address the key technologies associated with public safety networks – including LTE, narrowband and P25 – during IWCE 2013 in Las Vegas, March 11-15. Anritsu Co. introduces Windows-based remote control software for its PIM Master MW82119A, the industry’s first high-power, battery-operated, portable PIM test analyzer. With the software, field technicians on the ground can control an MW82119A configured on top of the tower, making it easier and more efficient to conduct highly accurate PIM measurements, especially for difficult-to-access sites, such as Remote Radio Head (RRH) installations. Anritsu Co. will be publicly demonstrating its new MW82119A PIM Master for the first time at NATE 2013 in Fort Worth, TX, February 18-21. In addition to the MW82119A, which is the industry’s first high-power, battery-operated, portable PIM test analyzer, Anritsu will be displaying its Site Master™ handheld cable and antenna analyzers, and Network Master™ MT9090 optical test platform in its NATE booth (#100). Anritsu Co. introduces the MS2027C and MS2037C, two new members of its VNA Master handheld vector network analyzer series that bring the inherent advantages of VNA Master to 15 GHz frequency applications. AT4 wireless and Anritsu Co. announce an agreement to bring Anritsu test equipment for 3G and LTE conformance and carrier testing to the AT4 wireless leading network of testing laboratories. Anritsu Corp. announces it is the first test equipment manufacturer to exceed 10,000 validated protocol conformance test cases across all Work Items and frequency bands for LTE and LTE Inter-RAT. The milestone, achieved at the recent GCF CAG#33 meeting in Farnborough, UK, was accomplished on the ME7834 Mobile Device Test Platform. Wavefront, Canada’s Centre of Excellence for wireless commercialization and research, and Anritsu Electronics Ltd., a leader in wireless test solutions, announce they have formed a partnership expected to lower the costs and increase the availability of long term evolution (LTE) development and testing in Canada for small and medium enterprise (SME) level businesses, device manufacturers, and mobile virtual network operators (MVNO). Anritsu Co. announces that Tech Mahindra has purchased the Anritsu ME7834L Mobile Device Test Platform (MDTP) to expand the LTE Conformance Test (CT) and Carrier Acceptance Test (CAT) capabilities provided by Tech Mahindra. The ME7834L enables the growing LTE device ecosystem with an additional source of test and certification services at Tech Mahindra’s lab, conveniently located in the New Jersey area. The MS2720T features a touchscreen, full-band tracking generators to 20 GHz, and best-in-class performance for dynamic range, DANL, phase noise, and sweep speed, providing unprecedented levels of spectrum monitoring, hidden signal detection, RF/microwave measurements, and testing of microwave backhauls and cellular signals. Anritsu Co. introduces three software packages supporting LTE-Advanced and five packages supporting IEEE802.11ac that extend the analysis capability of its MS269xA/MS2830A signal analyzers and MG3710A/MG3700A vector signal generators. With the software installed in the instruments, developers and manufacturers of LTE-Advanced UEs and components, as well as wireless LAN (WLAN) modules and devices have accurate solutions to verify performance, speed time-to-market, and lower cost-of-test. Anritsu Co. introduces the MG3740A analog signal generator that outputs AM/FM/ΦM test signals for evaluation of narrowband analog radio equipment used in public safety networks and private commercial networks. Anritsu Co. introduces Voice over LTE (VoLTE) supplementary service test capability for its MD8475A Signaling Tester that includes the ability to confirm operation of services, such as call forwarding and call waiting, under a variety of network conditions. Introduction of these options extends the MD8475A’s VoLTE test capability and builds on the Signaling Tester’s integrated functionality to simulate LTE and IP Multimedia Subsystem (IMS) networks as well as an IMS client, providing a comprehensive test environment for UE manufacturers to verify device functionality. Anritsu Corp., a global provider of innovative communications test and measurement solutions for more than 110 years, announces the opening of a 100 percent India subsidiary in Bangalore. The new office brings together marketing, sales, engineering, services, and support. By co-locating all the departments, the company expects to accelerate the rate of delivery of new products and provide better and broader support to its growing customer base in India. Anritsu also plans to start a branch office operation in Noida within this fiscal year. Anritsu Co. announces it was a sponsor of the third annual Disaster Management Initiative (DMI), held at Carnegie Mellon University, Silicon Valley (CMUSV) on November 4-5 at the university’s campus in Moffett Field, CA, in the heart of Silicon Valley. As part of the sponsorship, David Witkowski, senior product manager, Anritsu, led a session that focused on digital radio technologies for public safety, government, and infrastructure users. Anritsu Co. announces the industry’s first call-based LTE Advanced Carrier Aggregation testing capability that can be integrated into its MD8430A LTE Signaling Tester. The software-only upgrade leverages the four available RFs in the MD8430A, and provides 300 MB/s downlink throughput using two 2x2 MIMO Component Carriers (CCs). Anritsu Co. announces that its full portfolio of LTE device test solutions includes Band 14 capability to support the public safety community. This portfolio includes three LTE-capable test platforms, as well as two LTE-focused test systems. Applications for these solutions cover the complete LTE device development chain from functional test to PTCRB certification and aftermarket repair, and options for advanced functionality, such as Voice over LTE (VoLTE) and LTE Advanced/Carrier Aggregation, are available. Anritsu Co. introduces software options for its MT8820C radio communication analyzer that allows the one-box tester to perform testing of LTE FDD Band 22 and LTE TDD Band 42/43 LTE smartphones and mobile terminals. The extended functionality enhances the capability of the MT8820C, which can be used to test all mobile communications technologies, and allows the inherent cost and time efficiencies associated with the MT8820C to be realized in the development of LTE FDD Band 22 and LTE TDD Band 42/43 LTE phones and devices. Samsung Electronics Co. Ltd., a global leader in digital media and digital convergence technologies, has successfully demonstrated clear reception capabilities of LTE Broadcast services using evolved Multimedia Broadcast Multicast Service (eMBMS) technology using Anritsu’s Rapid Test Designer (RTD) and MD8430A to simulate the LTE network environment. Anritsu Co. introduces a burst detection enhancement for its MS272xC Spectrum Master handheld spectrum analyzer that makes it easier for field engineers and technicians to find narrow signals that may cause interference and adversely affect the performance of wireless networks. The Burst Detect mode extends the industry-leading performance of the MS272xC Spectrum Master analyzers, which feature the industry’s first 32 GHz and 43 GHz models, giving users powerful test tools for their field requirements. Anritsu Co. announced it has enhanced its “E” series Site Master and Cell Master handheld analyzers with the introduction of easyTest Tools aimed at helping engineers and field technicians create, deliver, and display cable and antenna analyzer work instructions. Anritsu Co. introduced a tracking generator for its Spectrum Master™ MS2711E, MS2712E, and MS2713E models that enhances the overall performance of the handheld analyzers, while making it easier and faster for field technicians to conduct additional measurements. Anritsu Co. announces the availability of integrated IP Multimedia Subsystem (IMS) functionality for its MD8475A Signaling Tester. Adding this LTE functionality extends the capabilities of the MD8475A’s SmartStudio graphical network simulation environment to include Call Session Control Function (CSCF), Dynamic Host Configuration Protocol (DHCP), and Domain Name System (DNS) servers, using either IPv4, IPv6, or dual-stack addressing. Anritsu Co. announces it will demonstrate the world’s only broadband Vector Network Analyzer (VNA) system that can conduct single sweeps from 70 kHz to 140 GHz in its booth (#807) at the International Microwave Symposium (IMS), to be held June 19-21, in Montreal. The on-wafer device characterization is one in a series of demonstrations to be conducted in Anritsu’s booth that will highlight test solutions for high-frequency designs, including E-band applications and high-speed signal integrity measurements. Anritsu Co. introduces a tracking generator for its Spectrum Master™ MS2711E, MS2712E, and MS2713E models that enhances the overall performance of the handheld analyzers. Anritsu offers a comprehensive range of RF/microwave power meters and sensors covering 100 kHz to 65 GHz. Anritsu Co. introduces options for its MS269xA series that enhance the wideband FFT analysis of the signal analyzers. By expanding the measurement capability of the MS269xA series with the hardware options, Anritsu strengthens its position as a world leader in test solutions for microwave and next-generation mobile networks by providing a highly accurate analysis tool that can capture wideband signals used in satellite and radar systems, as well as in LTE Advanced designs. Anritsu announces that it has entered into a Factory Test Technology Licensing Agreement with Qualcomm Inc. for Qualcomm’s factory test solutions. Microlease has become the first test equipment specialist to offer the newly-released Anritsu MW8209A PIM Master as a rental option. The analyser covers the 900 MHz band and is designed to address the growing requirement for the measurement of PIM in E-GSM networks, including UMTS Band VIII and LTE Band 8. Anritsu Company introduces 64-Gbaud PAM4 PPG and 32-Gbaud PAM4 ED modules supporting 400 GbE and Over 400 G bit error rate (BER) tests for its Signal Quality Analyzer-R MP1900A BERT. Anritsu Co. introduces two software packages (MX887019A and MV887019A) for its Universal Wireless Test Set MT8870A to support 3GPP-compliant tests on 5G sub-6 GHz New Radio (NR) chipsets, devices and systems. Anritsu Corporation announces that Huawei has endorsed Anritsu’s MT8870A high speed wireless test platform for its RF calibration and validation tests. The Universal Wireless Test Set provides support for the Hi2110 and Hi2115 NB-IoT chipsets. Anritsu Company introduces the Signal Analyzer MS2850A that can cost efficiently and accurately evaluate 5G signals with the 800 MHz modulation bandwidth (8 x 100 MHz channels) associated with 5G designs. With analysis bandwidth up to 1 GHz, excellent dynamic range and high flatness performance, the MS2850A provides wireless equipment manufacturers and mobile operators with a comprehensive and affordable tool. Anritsu Company introduces the Universal Fixture Extraction (UFX) option for its VectorStar® vector network analyzers (VNAs) to provide signal integrity and on-wafer engineers with an increased range of on-wafer and fixture calibration choices, even when a full set of calibration standards is not available. Anritsu Co. introduces cellular module test application (CMTA) software for its signaling testers MD8475A/B which provides test cases to dramatically simplify testing chipsets and automotive-related telematics modules used in connected car designs and implementation. Integrating the new CMTA test package with the MD8475A/B through Anritsu’s innovative SmartStudio GUI allows automotive manufacturers and suppliers to verify operation in various carrier environments. Anritsu Co. introduces the Signaling Tester MD8475B, the world’s first all-in-one test solution supporting up to four component carrier aggregation (4CC CA) and 2 x 2 MIMO in a single test box. Integrated with the SmartStudio GUI, the MD8475B lowers cost-of-test and reduces space requirements compared to conventional solutions that require several test instruments, providing engineers with a highly efficient tool to conduct tests on chipsets, modules, and mobile platforms. Anritsu Co. released a version of its award-winning SkyBridge Tools™ Test Manager that supports OTDR measurements to establish the industry’s first comprehensive field test automation tool that supports both RF and optical testing. By reducing test time by as much as 90% and increasing accuracy more than 10 times, SkyBridge Tools dramatically simplifies network installation verification. Anritsu Co. expands its field test portfolio with the introduction of PIM Hunter,™ a passive intermodulation test probe that helps field technicians more quickly discover the precise location of external PIM sources at cell sites. Designed for use with Anritsu’s PIM Master,™ Spectrum Master™ and BTS Master™ handheld analyzers, the PIM Hunter test probe enables field professionals to use traditional interference hunting techniques. Anritsu Co. introduced software for its radio communications analyzer MT8821C that creates the industry’s first test solution that supports evaluation of 4 x 4 MIMO 256 QAM RF Rx performance for all DL 3CC CA band combinations with no restrictions on frequency and signal bandwidth combinations. The software provides wireless chipset and UE manufacturers. The MA24507A Power Master™ frequency selectable millimeter wave (mmWave) power analyzer from Anritsu is the world’s first frequency selectable RF power sensor. By utilizing Anritsu’s patented Shockline nonlinear transmission line (NLTL) technology, Power Master combines the industry’s widest power measurement range, fast measurement speeds and the ability for the user to define the frequency of the signal to measure. Anritsu Co. introduces the ultraportable Site Master™ S331P, the lightest, smallest, fastest and most cost-efficient Site Master field cable and antenna analyzer ever developed. Addressing the market need for broad frequency coverage and high performance in an extremely compact and economical design, the S331P provides wireless operators and contractors with the first pocket-sized headless cable and antenna analyzer that can measure the new LTE-U frequencies. Anritsu Co. introduces CPRI RF measurement capability in its market-leading E series of Site Master™, Spectrum Master™, and Cell Master™ handheld field analyzers that dramatically simplifies and lowers the cost of testing remote radio heads installed atop 4G towers. The option reduces network OpEx by allowing wireless carrier engineers, technicians and contractors responsible for wireless networks to identify interference sources on the radio uplink at ground level, reducing the use of unnecessary and costly tower climbing crews. Anritsu Co. expands its Signal Analyzer MS2840A family with the introduction of three models that support the 9 kHz to 3.6 GHz, 6 GHz, and 26.5 GHz frequencies. With the instruments, Anritsu fills a market void for cost-efficient, high-performance signal analyzers that address the middle frequency ranges, providing an economical solution to accurately measure wireless equipment, oscillators and other components for narrowband applications, and more. Anritsu Company continues to address the test needs of signal integrity (SI) engineers with the introduction of options for its VectorStar® and ShockLine™ vector network analyzers (VNAs). The VectorStar Eye Diagram and ShockLine Advanced Time Domain (ATD) options are part of the expanding SI capabilities offered by Anritsu and provide SI engineers with improved tools to conduct channel diagnostics and model validation of high-speed digital circuit designs. Anritsu Corp. announced that Amsterdam Internet Exchange (AMS-IX) has selected the MT1100A 100 G/OTU4 Network Master Flex Analyzer. This increases the test and measuring investment that AMS-IX has made with Anritsu following on from the two MD1260A 100G IP/Ethernet analyzers. MT1100A Network Master Flex is designed to meet all of these demands, and to provide all the testing requirements for the second wave of innovation in the 40/100 GbE networks. Anritsu Company introduces the MS2840A signal analyzer that features broad frequency coverage of 9 kHz to 44.5 GHz and best-in-class close-in SSB phase noise performance. With the high-end performance and frequency coverage that can be extended to the millimeter wave (mmWave) range, the MS2840A is a highly accurate tool to conduct wideband and narrowband measurements on next-generation 4G/5G designs, microwave and mmWave wireless backhaul and more. Anritsu Corporation has strengthened the wireless test functions of the all-in-one radio communication analyzer MT8821C with the release of four new software packages for evaluating LTE-Advanced UE supporting downlink (DL) 4 x 4 MIMO and ddownlink carrier aggregation (DL CA) 5CCs. As well as expanding the MT8821C measurement functions, these latest software packages also strengthen the easy-to-use GUI with enhanced parameter search features. Anritsu Company introduces software packages for its all-in-one radio communication analyzer MT8821C that support LTE-advanced UE downlink (DL) 4 x 4 MIMO and downlink carrier aggregation (DL CA) 5 CCs. The new software packages further strengthen the test functionality of the MT8821C and help create a single-instrument solution that can speed time to market and lower test costs of LTE-advanced chipsets, smartphones, tablets and M2M modules used in IoT applications. Anritsu Corp. is pleased to announce the release of its High Performance Waveguide Mixer MA2806A to expand millimeter-wave measurement solutions. Connecting the new MA2806A to Anritsu’s Signal Analyzer MS2830A supports spectrum measurements in the 50 to 75 GHz band (V-band) currently used by various millimeter-wave sensors, WiGig Gigabit Wireless LAN (802.11ad), and broadcast video camera streaming equipment. Anritsu Company continues to expand its industry-leading field test portfolio with the introduction of the MS27101A Remote Spectrum Monitor. The most recent edition to Anritsu’s interference detecting tools, the MS27101A can be used with Anritsu’s Vision™ software to create a highly accurate remote solution for government regulators and university lab researchers to identify interference patterns as well as record spectrum history. Anritsu is pleased to announce the addition of two frequency solutions to their Shockline MS46500B series of 2 and 4 port vector network analyzers (VNAs). The new models include a unique E-band option for testing and verifying the efficiency of passive components during manufacturing, and a high performing 20 and 40 GHz Microwave option. Anritsu Company announces support for LTE-A 3 Carrier Aggregation (3CA) Carrier Acceptance Test (CAT) requirements. The ME7834LA is a scalable GCF, PTCRB, and carrier-validated test system that enables certification of 3G and LTE devices to industry and carrier standards. It provides test coverage for 3GPP 36.523 as well as a wide portfolio of CAT test plans across multiple operators. For existing users of the ME7834L platform, an upgrade path is available with support. Anritsu introduces a CPRI RF measurement option for its BTS Master™ handheld base station analyzer family that can significantly reduce the operational expense associated with troubleshooting interference at base stations. The BTS Master-based CPRI RF measurement test set allows field engineers and technicians to conduct accurate RF measurements on remote radio heads (RRHs) while remaining at ground level. Anritsu Co. introduces the MT8821C Radio Communication Analyzer, an all-in-one RF tester with the widest capability for supporting LTE-advanced (LTE-A), as well as all other adopted technologies. The MT8821C supports 2 to 4 G wireless tests, making it a cost-effective single-instrument solution to validate co-existing UEs integrating multiple technologies. Covering 30 MHz to 6 GHz, it can conduct RF TRx tests in compliance with the 3 GPP and 3 GPP2 standards. Anritsu introduces the MA24208A/MA24218A universal USB power sensors that leverage Anritsu’s patented triple path architecture to provide highly accurate, true RMS measurements of CW, multi-tone, and digitally modulated signals up to 18 GHz. Combining a broad measurement range of -60 to +20 dBm with measurement speeds of >1,600 readings/s continuous and >11,000 readings/s buffered, the MA24208A/MA24218A bring a high level of performance to a variety of applications. Anritsu Company introduces a vector voltmeter mode (VVM) for its Microwave Site Master™ S820E – the world’s only handheld cable and antenna analyzer offering coverage up to 40 GHz – that allows the S820E to be used as a drop-in replacement for legacy Vector Voltmeter instruments. The Site Master S820E combines leading-edge performance, functionality, reporting and durability to meet the most demanding field testing requirements. Anritsu Company introduces Web Remote Tools for its Spectrum Master™ MS2720T handheld spectrum analyzer that allows the instruments to be controlled from any web-enabled device, including laptops, tablets, and smart phones, over an Ethernet link. Web Remote Tools test Remote Radio Heads (RRUs) and other inaccessible radio units at 3G and 4G base stations. Anritsu Co. expands its ShockLine™ family of vector network analyzers (VNAs) with the introduction of the MS46122A series. Incorporating Anritsu’s patented shock line VNA-on-a-chip technology, the MS46122A low-cost full-reversing 2-port VNAs are packaged in a very compact 1U chassis and are optimized for ultra-cost-sensitive test applicatios in manufacturing, engineering, and education environments. Anritsu Company introduces options for its MD8475A Network Simulator platform that support WLAN Offload smartphone testing, creating an accurate and efficient test solution for verifying mobile devices early in the device integration test process. The MD8475A simulates real-world carrier network implementation of industry-standard WLAN Offload functions. 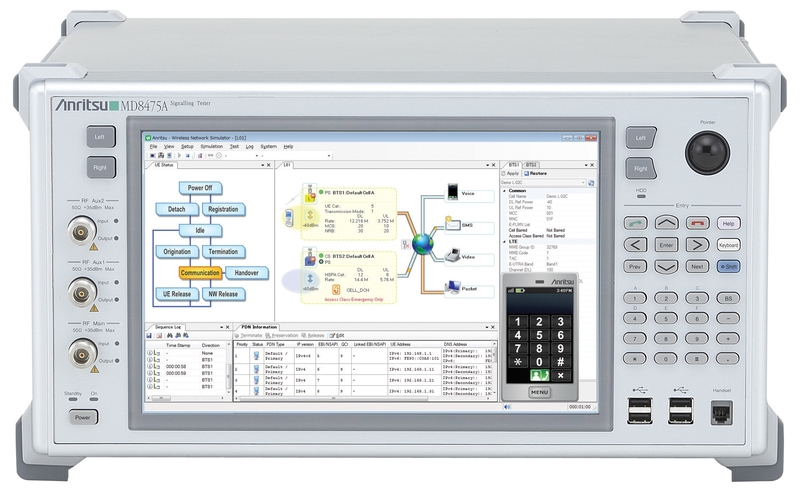 The MD8430A is a scalable LTE network simulator, with six models ranging from functional test model (FTM) to enhanced test model (ETM), and available software options for both LTE FDD and TDD for any model. The associated rapid test designer (RTD) graphical test software enables quick scripting of tests, with an intuitive user interface as well as available layer 3 and lower-layer libraries. Anritsu Company, as part of its commitment to support global wireless standards, announces that it is the market leader in approved test cases for TD-LTE Carrier Aggregation and is the only test company with Global Certification Forum (GCF)-approved TD-LTE test cases in the IMS Voice over LTE (VoLTE)-related technology of aSRVCC. Anritsu Co. introduces a mobile interference hunting system that helps field engineers and technicians locate sources of interference more accurately. Integrating an easy-to-use interface, fast setup times and numerous features to effectively hunt a variety of signal types in multiple RF environments, the comprehensive solution provides wireless carriers, regulatory agencies, and broadcast and satellite operators with a tool that saves time and money. Anritsu Co. breaks new ground in field wireless test with the introduction of the MW82119B PIM Master™, which combines a 40 W, battery-operated PIM analyzer with a 2 MHz to 3 GHz cable and antenna analyzer, eliminating the need to carry multiple instruments to measure the RF performance of a cell site. It is MIL-STD-810G drop test rated and is designed to withstand transportation shock, vibration and harsh outdoor test conditions. The VectorStar ME7838D 145 GHz Broadband system is the first VNA combining RF, microwave and two mm-wave bands in a single coaxial output. Through the use of the Anritsu-developed 0.8 mm coaxial connector, frequencies up to 145 GHz can be propagated within a coaxial transmission line without waveguide flange connections. Anritsu Co. addresses the market need for value and performance when testing RF passive devices with the introduction of the ShockLine™ MS46522A 2-port RF VNA family with frequency coverage from 50 kHz to 8.5 GHz. The ShockLine MS46522A VNA is designed for testing passive devices such as cables, connectors, filters, and antennas in a wide variety of engineering, manufacturing and education applications. Anritsu Co. announces it has developed the wireless industry’s first PTCRB-approved protocol test case for IMS Emergency Services. This critical test case is now available on the ME7834L Protocol Conformance Test (PCT) and Carrier Acceptance Test (CAT) system. Anritsu recently became the only supplier of approved test cases for this increasingly relevant technology during the PVG#64 meeting held in Beijing. Anritsu's internal atomic clock option for its MS2720T Spectrum Master handheld spectrum analyzer allows users to acquire excellent frequency accuracy, including in environments in which the GPS cannot be used. Integrating the atomic clock inside the MS2720T provides field engineers and technicians with a durable, handheld spectrum analyzer that can deliver the extremely high accuracy necessary to prove regulatory compliance. Anritsu Co. announces that its ME7873L RF/RRM Conformance Test System has achieved the world’s first test platform approval criteria (TPAC) for LTE-advanced carrier aggregation (CA). This industry-leading achievement in the Global Certification Forum (GCF) enables wireless device manufacturers to implement certification of devices employing this new technology. Anritsu Company introduces three frequency options for its industry-leading PIM Master MW82119A Passive Intermodulation (PIM) high-power, battery-operated, portable PIM test analyzer. The new options provide wireless field engineers and technicians with the first battery-operated handheld analyzers that can accurately conduct “top of the tower” PIM measurements in the LTE 800 MHz and UMTS 2100 MHz bands, in addition to the LTE 2600 MHz band. Anritsu Company introduces the MT8220T BTS Master, a multi-function handheld durable tester with all the capabilities network operators, sub-contractors, installers, and regulatory authorities need when measuring base stations. By providing multiple testing capabilities, including comprehensive Over-the-Air (OTA) measurements to support Remote Radio Heads (RRH) and MIMO, it is well suited for co-siting of new systems with existing networks. Anritsu Company announces the availability of LTE Advanced Carrier Aggregation (CA) Measurement Software for its MT8820C RF tester, enabling analysis of leading-edge mobile devices incorporating the new ultra-fast technology evolution. The new option leverages the ParallelPhone Mode (PPMTM) dual-RF capability of the MT8820C to simulate inter-band and intra-band downlink frequency domain duplex (FDD) CA with call processing. Anritsu Company introduces the MT8870A universal wireless test set with manufacturing test capability for up to eight user equipment (UE) devices in a single mainframe without the need for external switching. The tester’s basic module includes an integrated vector signal analyzer (VSA), vector signal generator (VSG), and multi-core processor. Anritsu Company introduces the MG3710A series, a family of innovative vector signal generators that combines high performance and eliminates the need for multiple instruments, thereby reducing operating costs and increasing production yield for designers and manufacturers of multi-system devices and base stations. Its unique design allows the MG3710A to generate test signals based on all leading technologies. 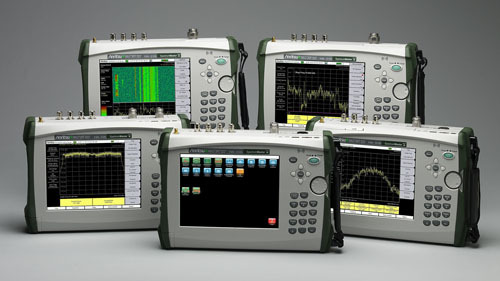 The Anritsu MT8852B Bluetooth Test Set is the market leading RF measuring instrument for design proving and production test of a wide range of products that integrate Bluetooth technology, including; phones, headsets, computers, audio-visual and gaming products as well as modules. In production, a single key press initiates a measurement script that tests a device in less than 10 seconds. Anritsu's family of Spectrum Master handheld spectrum analyzers offers five models to choose from including the industry’s first 32 GHz and 43 GHz models. Models MS2722C, MS2723C, MS2724C, MS2725C, and MS2726C represents the company’s highest performance handheld spectrum analyzers. Anritsu’s handheld, battery-operated Broadband Site Master is the most accurate and convenient tool available for field installation, verification, troubleshooting and repair of microwave cables and communication systems. With calibrated vector error correction and a convenient user interface, difficult test specifications become easy to verify, quality is improved and maintenance expenses are reduced. The MT8212E and MT8213E Cell Master Base Station Analyzers are the smallest, lightest, and most economical solution for 2G/3G/4G, and WiMAX base station transmitter testing and ISDB-T and DVB-T/H digital broadcast field testing. The S412E is Anritsu's second generation solution for installing and maintaining public safety systems. Built on Anritsu's ninth generation handheld platform, the S412E combines a high performance receiver / spectrum analyzer with the world's most advanced handheld vector network analyzer plus a CW / P25 / NXDN / DMR signal generator with internally adjustable power from 0 dBm to –120 dBm. The MS2721B handheld spectrum analyzer is designed to conduct highly accurate analysis on the new wave of wireless LAN and cellular signals, including 802.11a, 3G, ultra-wideband, WiMAX, and wireless medical patient monitoring systems. Anritsu’s MS2712E and MS2713E Spectrum Master™ spectrum analyzers are designed to handle the most punishing field conditions and allow you to monitor, locate, identify, and analyze a broad range of cellular, land mobile radio, Wi-Fi, and broadcast signals. The title Grand Master suggests the ultimate level of skill, experience, accomplishment and recognition as best in class. The VNA Master Series is the industry’s highest performance, handheld solution for 2-port, 2-path measurements, anytime, anywhere. The VNA Master MS202xB/3xB series is a compact handheld multi-function instrument that offers a portable yet powerful vector network analyzer, allowing you to do S-parameter analysis in the field ― anytime, anywhere. The BTS Master MT8221B is Anritsu's high performance base station analyzer. From the ground up it has been designed to support 4G standards and installed 2G/3G networks. Regulatory requirements are growing. You're under increasing pressure to cut costs. And improving system up-time is always a top priority. The MS2711E Spectrum Master helps you do all of this and more. The value choice for deploying, maintaining and troubleshooting wireless base stations. Compact and lightweight, it combines the functionality of built-in cable and antenna analyzer, spectrum analyzer, power meter, and GPS. Anritsu Company introduces its first generation high performance PIM testing solution, the MW8219A, for the 1900/2100 MHz PCS/AWS frequency bands. Anritsu has developed the PIM Master to verify if receiver interference at a cell site is due to an intermodulation product of two or more transmit frequencies, also known as passive intermodulation (PIM). Anritsu introduces broadband vector network analyzer with industry-best performance from 70 kHz to 110 GHz in single coax connection and up to 0.5 THz with millimeter waveguide extensions. ME7838A ushers in new era in broadband characterization of active and passive devices from DC to daylight. Anritsu introduces industry's most affordable, yet comprehensive solution, the MS2024B VNA Master (500 kHz to 4 GHz). It's a Vector Network Analyzer, it's a Power Meter and it's a Vector Voltmeter. Anritsu Company introduces its first generation high performance PIM testing solution, the MW8208A, for the 850 MHz cellular frequency bands. Anritsu has developed the PIM Master to verify if receiver interference at a cell site is due to an intermodulation product of two or more transmit frequencies, also known as passive intermodulation (PIM). Anritsu Company introduces the MG37020A fast-switching microwave signal generator that utilizes an advanced VCO-based hardware architecture to achieve best-in-class frequency switching speed of 100 µsec per point. Anritsu Company introduces three software packages for its MS269xA Signal Analyzer Series. Taking full advantage of the MS269xA Series’ total level and modulation accuracy over the bandwidth from 50 Hz to 6 GHz, the MX269020A LTE Downlink Measurement Software, MX269021A LTE Uplink Measurement Software, and MX269908A LTE IQproducer™ help ensure compliance of LTE devices. Anritsu Company has enhanced its MS271xB family so that the economy microwave spectrum analyzers now provide specialized demodulation hardware and pre-written test routines for six popular wireless system configurations – Fixed and Mobile WiMAX, W-CDMA/HSDPA, cdmaOne, CDMA2000, EVDO, and GSM/GPRS/EDGE. Anritsu Company introduces the MD8430A Signaling Tester, the industry’s first LTE base station simulator. Providing flexible and responsive support for the latest 3GPP LTE standard, the MD8430A is a highly accurate cost-effective solution for manufacturers of LTE chipsets and mobile devices to evaluate their products and improve time to market. 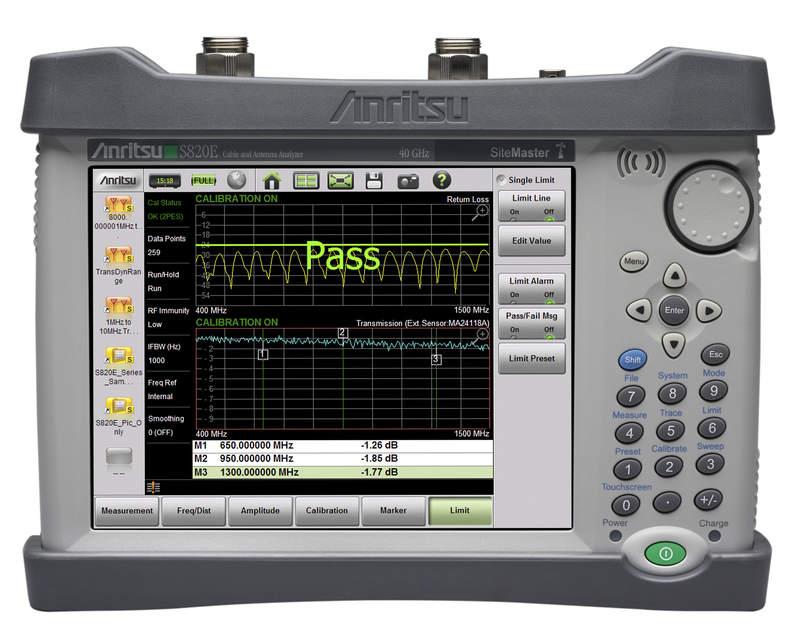 Anritsu Introduces High Performance Handheld 2-Port Vector Network Analyzers. New VNA Master Models Have Frequency Coverage from 5 kHz to 20 GHz with 750 µsec/pt Measurement Speed To Ensure Accurate 2-Port Measurements. Anritsu Co. introduces the MT8855A, an integrated test set capable of measuring the new generation of products using the Bluetooth Advanced Audio Distribution Profile (A2DP), headset profile and hands-free profile. Providing frequency coverage of 20 Hz to 20 kHz, the MT8855A offers lower cost-of-test and significantly reduced development time. Anritsu Company, a global leader in LTE test solutions, introduces software packages for MG3700A and MS269xA Series Expand Anritsu LTE Test Offering; Anritsu Now Supports Both LTE Modes. Anritsu Company announces it has extended the low-end frequency of its MN469xB VectorStar 4-port test sets, making the instruments the first microwave multiport Vector Network Analyzer (VNA) solutions to measure down to 70 kHz. The MN469xB series now combines DC coverage and the wide dynamic range time domain capability of a VNA. Cost-effective LTE fading simulator introduced by Anritsu Company. MF6900A is designed for use with MD8430A signaling tester and provides LTE terminal and chipset manufacturers with cost-efficient, accurate test solution. P25 and NXDN measurement options for handheld spectrum analyzers introduced by Anritsu Company. Installers, maintainers, and certifiers of public safety and business communications systems have advanced test tool to ensure network operation. Anritsu Company introduces the MS202xB/MS203xB VNA Master™ series, the highest-performing handheld RF vector network analyzers (VNAs) in the industry. With frequency coverage from 500 kHz to 4/6 GHz, and featuring multi-instrument functionality in a rugged, lightweight design that can withstand harsh environments. With companies looking for even greater efficiencies, the need to re-use not only hardware but software components is essential. Enormous investments in legacy systems cannot be disposed of so the ME7834 mobile device test platform provides the most flexible way to combine existing and new components. Anritsu introduces the new MS26682 spectrum analyzer. Anritsu Company introduces a software option for its MD8480C W-CDMA/GSM Signaling Tester that enables testing for the latest W-CDMA/GSM devices supporting simultaneous 64QAM and MIMO. This release builds on existing W-CDMA/HSPA support in the MD8480C. Anritsu Company announces it has enhanced the LTE measurement capabilities in its MS272xC Spectrum Master™ and MT822xB BTS Master™ series of handheld analyzers. With the new analysis tools added to the existing measurement capabilities, field engineers and technicians have handheld instruments that can conduct nearly all the measurements necessary to successfully deploy, commission, and maintain LTE networks. Anritsu Co. introduces software for its MS269xA and MS2830A series Signal Analyzers, as well as its MG3700A Vector Signal Generator to create single-instrument solutions that support the IEEE 802.11n/p/a/b/g/j wireless LAN (WLAN) standards. Anritsu introduces PIM Master™ model for UMTS band VIII and LTE band 8 networks. The MW8209A brings inherent advantages of PIM Master, including distance-to-PIM technology, to E-GSM 900 MHz band. New-generation, eco-friendly signal analyzer supporting high-level measurement speeds and performance at low cost to help raise R&D efficiency and productivity. Anritsu Company introduces an on-screen coverage mapping option for its “E” Series Spectrum Master™, Site Master™ and Cell Master™ handheld analyzers. The option has been developed to help wireless service providers, public safety users, land mobile radio operators and government officials verify system coverage and perform spectrum clearing before installing new radio services. Highly Accurate Microwave USB Power Sensors with Range to 18 GHz Introduced by Anritsu Company. MA24108A / MA24118A Provide Accurate Power Measurements up to 18 GHz over 60 dB Dynamic Range and are Well Suited for Commercial and Aerospace / Defense Applications. Anritsu Company introduces the first test solutions that support next-generation PHS (XGP: eXtended Global Platform) to help ensure the successful rollout of XGP in the marketplace. Three software packages have been developed for use with Anritsu’s MS269xA Signal Analyzers and MG3700A Vector Signal Generator. Anritsu Company introduces test functions for W-CDMA mobile terminal UMTS bands XI (1.5 GHz) and III (1.8 GHz) for its ME7873F Performance Test System. With the expanded test capability, the ME7873F now offers mobile terminal carriers and manufacturers a comprehensive and simple test platform that supports all UMTS bands for testing the RF performance of user equipment. Anritsu Company introduces the MA24106A, a highly accurate power sensor that measures True-RMS power, regardless of the input signal or its bandwidth, over 63 dB of dynamic range from 50 MHz to 6 GHz. Ideal for measuring average power of CW, multi-tone, and modulated RF waveforms, such as those used in 3G, 4G, and OFDM designs. Modern Vector Network Analyzer (VNA) architectures such as those based on Nonlinear Transmission Line (NLTL) samplers and distributed harmonic generators now offer a beneficial alternative to traditional sampling VNAs. They allow for a simplified architecture and also enable VNAs that are much more cost effective. It is shown that NLTL technology results in miniature VNA reflectometers that provide enhanced performance over broad frequency ranges, and reduced measurement complexity, providing VNA users a unique and compelling solution for their high-frequency measurement needs. Next generation radar systems face multiple difficult demands. The pace and variety of new requirements need multi-use/function/mode adaptive radars, to be used for different applications. This whitepaper reviews existing pulse measurement test methods; discusses advantages/limitations; and introduces new test method that takes advantage of high-speed digitizing architecture, offering the industryâ? ?s highest resolution/timing accuracy level. Vector Network Analyzers (VNA) are your primary resource when analyzing and characterizing systems and components for RF and Microwave measurements. They are regarded as accurate measuring instruments, however, quantifying the accuracy performance of a VNA in a specific application can be challenging. VNA specifications are a starting point; but, they are based upon very specific calibration and measurement conditions, which are not applicable for many applications. In this guide, the concept of calibration is presented and discussed in detail. Specific topics to be covered include how to configure the VNA for calibration, types of calibration and calibration kits. A minimal amount of calibration mathematics and theory will also be covered. In this white paper we look at the impact of calibration downtime during on-wafer testing and discuss how recent advances enable longer time periods between calibrations. Testing at millimeter-wave frequencies brings new and different measurement challenges, so minimizing measurement uncertainty is critical in the development of these new technologies. This white paper discusses the challenges associated with millimeter-wave testing and how to optimize your Vector Network Analyzer (VNA) measurement capability to provide the confidence required to make performance/cost tradeoffs. The True Balanced/Differential techniqueÂ uses two sources to create actual differential and common-mode stimuli, hence the shortened name true-balanceÂ. This white paper offers guidance to signal integrity designers on the differences between these approaches and which one may best fit their need. The Anritsu VectorStars Noise Figure Option 041 enables the capability to measure noise figure (NF), which is the degradation of the signal-to-noise ratio caused by components in a signal chain. The NF measurement is based on a cold source technique for improved accuracy. Various levels of match and fixture correction are available for additional enhancement. VectorStar is the only VNA platform offering a Noise Figure option enabling NF measurements from 70 kHz to 125 GHz. It is also the only VNA platform available with an optimized noise receiver for measurements from 30 to 125 GHz. The Anritsu VectorStar’s Noise Figure – Option 041 enables the capability to measure noise figure (NF), which is the degradation of the signal-to-noise ratio caused by components in a signal chain. The NF measurement is based on a cold source technique for improved accuracy. Higher data rates can create challenges for traditional de-embedding techniques. As frequencies approach 70 GHz or even 110 GHz, errors related to fixturing can be greater than those of the “device under test” or DUT. Designers, modelers, and manufacturers of RF and microwave frequency amplifiers used in applications such as radar, wireless communication, or high-speed digital communication systems at either the wafer-level or as a packaged part face many test challenges. Accurate measurements are needed to better understand higher order harmonics, as will new challenges related to conductor skin effects and dielectric losses on PC boards, along with the design trade-offs related to choices of vias, stackups, and connector pins. Signal Integrity applications commonly utilize balanced/differential transmission lines which are typically characterized using vector network analyzers (VNA). There are two approaches to performing these measurements and the selection of the best method depends on what you need to measure. The Anritsu Option 20 tracking generator provides state of the art features not seen with other competitive hand-held analyzers. This includes capabilities such as 0.1 dB power step size, a wide dynamic range and a power output flatness of ±1 dB. The instantaneous traffic rates at internet data centers have reached 1 Tbit/s and device interconnects are becoming transmission bottlenecks. Assuring signal integrity at high data rates while minimizing cost requires closing the loop of simulation and measurement during the design stage. Cloud computing, smart phones, and LTE services are causing a large increase in network traffic. The instantaneous traffic rates at internet data centers have reached 1 Tbit/s. To support this increased traffic, speed of IT equipment – such as those used in high-end services in data centers – must be increased.